This is a Consignment Items, so actual shipping charges will be applied. Vintage quilt from the 1930s measuring 70" x 70". At first glance it looks like a Triple Irish Chain. But if you look at the careful fabric placement, it is closer to Jewel Box. There are 25 blocks, measuring 10"x10", set straight (5x5). 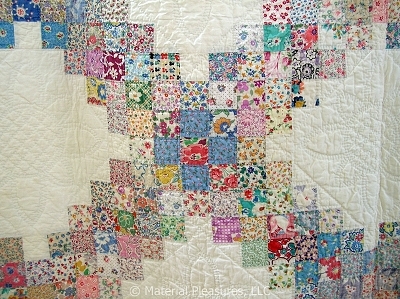 There are 3 borders, 2 2.5" white solid borders surround a 4" pieced border with more squares on point. It is machine pieced, hand quilted in white thread to each piece, large sunflower like motifs in the open white areas, and cables in the borders. There is an applied blue binding (by machine front; by hand back). Backing is white cotton solid, and the batting is thin. It is in very good condition with no spots, tears, wear or odors. . Please Click on the Gallery for additional images.